With part one of the second season of Teen Titans Go! 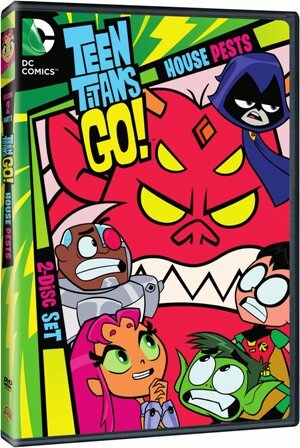 recently out on DVD, Warner Bros. Home Entertainment has announced the upcoming release of Teen Titans Go! : House Pest – Season 2 Part 2. The two-disc, four-hour-plus DVD will be available to own on August 18, 2015. Teen Titans Go! has been a consistently high-rated cable program, one of the most successful currently airing on Carton Network (number one show for “Boys 6-11” and number two for “Kids 6-11”). Stay tuned for more information about Teen Titans Go! : House Pest – Season 2 Part 2 as the release date nears.